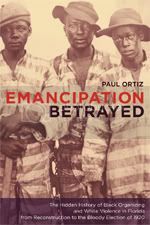 Paul Ortiz -- a professor in the community studies program at the University of California at Santa Cruz and an Institute for Southern Studies advisor and former board member -- will be reading from and discussing his book Emancipation Betrayed at Internationalist Books and Community Center in Chapel Hill, N.C. tonight, Wednesday, Sept. 12. Covering the hidden history of black organizing and white violence in Florida beginning in the 1870s, Ortiz's book examines the struggle of black Floridians to create the first statewide civil rights movement. Ortiz documents how blacks formed mutual aid organizations including secret societies, women's clubs and labor unions to fight Jim Crow in Florida, which at the time had the highest lynching rate of any U.S. state. The book culminates in the bloody election of 1920, where white supremacists with state sanction violently prevented blacks from casting ballots. The talk begins at 7 p.m. and is free. Internationalist Books is located at 405 W. Franklin St. in Chapel Hill. For more details on the book and the event, click here.